We can easily imagine scenarios in which private nonviolent action could pressure bigots into changing their racial policies. Students were beaten and jailed, but they won the day, Gandhi-style, by shaming the bigots with their simple request to be served like anyone else. The sit-ins then sparked sympathy boycotts of department stores nationwide. The campaign wasn’t easy, but people seized control of their own lives, shook their communities, and sent shockwaves through the country. ...the owner of property should be free to set the rules of use, the only constraint being that the owner may not use aggressive force against others... Admittedly, that leaves room for loathsome peaceful behavior, such as running a whites-only lunch counter. Who imagined that freedom of association couldn’t have its ugly side? ...Nevertheless, individuals are either free to do anything peaceful or they are not. ...Why is this inspirational history [of protest] ignored in the current controversy? I can think of only one reason. So-called progressives at heart are elitists who believe – and want you to believe – that nothing good happens without government. If this seems out of character for a capitalist, it is - and it isn't. For reactionaries, the rule for fighting injustice always changes depending on where the threat is coming from. If the left has been shut out of power, and is left to its last-resort shaming and disruption tactics, reactionaries will insist that even these tactics are illegitimate since they violate various norms of civility and rationalistic discourse. But if, on the other hand, the left is actually in a position to exercise power, then we get arguments like this: capitalists graciously let us have our shaming and disruption, while insisting that we should not actually govern. Socialists, of course, should reject even that deal - what makes us socialists is that we will not limit our fight against reactionaries to the private sector. If the worst the right has to fear from us is a little incivility, we aren't doing our job. As the 2018 elections approach, a familiar question has resurfaced: should Democrats - or for that matter, the American left - even try to win over Trump voters? Naturally, answers to this question will tend to depend on our understanding of Trump voters and their motivations. If we suppose that some Trump voters are just contrarians, or fans of The Apprentice, for example, it is possible to imagine the left winning them over without compromising its principles. If on the other hand we decide that Trump voters mostly want capitalist ethnonationalism, it doesn't seem likely that the left can seriously pursue them without compromising its values. STAUNCH CONSERVATIVES are "steadfast fiscal conservatives, embrace moral traditionalism, and have a moderately nativist conception of American identity and approach to immigration." FREE MARKETEERS are "small government fiscal conservatives, free traders, with moderate to liberal positions on immigration and race." AMERICAN PRESERVATIONISTS are "economically progressive, believe the economic and political systems are rigged, have nativist immigration views, and a nativist and ethnocultural conception of American identity." THE DISENGAGED "does not know much about politics, but what they do know is they feel detached from institutions and elites and are skeptical of immigration." 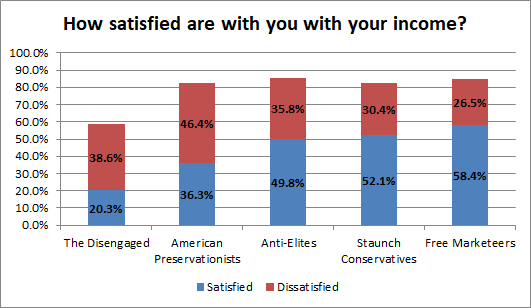 The DFVSG's breakdown reveals that Disengaged Trump voters were dissatisfied with their income by a margin of 18.3%, while Free Marketers voiced a margin of 31.9% satisfaction - a gap of more than fifty percent. Average out Trump voters into a monolithic base with identical motivations and you miss all of this. Generally, while Trump voters have unfavorable views of both politicians, they remain significantly more opposed to Clinton than Sanders. Treat Trump voters as a monolith, and you can pretend that this gap comes from sympathy Sanders has earned from racists, ethnonationalists, and even capitalists. When we divide them into clusters, however, it is clear that the exact opposite is true: Sanders earns most of his opposition from Stanch Conservatives, Free Marketeers, and American Preservationists, and polls best among Anti-Elites and The Disengaged. Among the latter two - who account for nearly a quarter of Trump's constituency - unfavorable views towards Sanders drop by more than fifty percent. people who feel the government has let them down, the economy has let them down, nobody cares about them, nobody worries about what happens to their lives and their futures; and they're just desperate for change. This strikes me as a decent demographic for Trump's opponents to target in 2018 - but if the DFVSG's polling is any indication, the way you do that is to run to Clinton's left.